The design of a SunCatcher acts like a natural thermostat, taking advantage of the changing angles of the sun throughout the seasons. We maximize solar input during the coldest months to increase heating and photosynthesis, then minimize input during the hottest months to reduce heating while allowing diffuse light for photosynthesis. Venting supplements this cycle by naturally introducing fresh air while removing excess moisture and CO2 depleted air. In the northern hemisphere, the winter sun travels in the southern portion of the sky, rising in the east and setting in the west. Therefore, it is important to face your SunCatcher’s glazed surface as close to south as possible. As mentioned above, it is critical to orient your SunCatcher towards the south. 15 degrees east of south is optimal to maximize solar gain in the early morning when your SunCatcher will be the coldest (and correspondingly reduce the late afternoon when it is hottest). Glazing (the clear surfaces) uses optimal angles and materials to manage Solar Gain. Solar Gain is the incoming sun rays that enter the SunCatcher, used for photosynthesis by the plants and to heat the structure. The most effective angle of the SunCatcher’s glazing to maximize solar gain for locations in the northern hemisphere is 60° up from horizontal. At this angle we maximize winter solar gain and conversely minimizes solar gain during summer months. For even better performance, the SunCatcher interior can include light color reflective surfaces, which reflect incoming solar radiation in the winter months back toward the plant growing space and thermal mass. These two features increase the amount of natural light reaching the plants compared to the amount of light that same footprint outside of the structure would normally receive during winter months. Insulation reduces heat loss through surfaces like the walls, floor, roof, and glazing. Like all energy efficient structures, SunCatchers are well insulated and designed to trap and store heat for as long as possible. Unlike a conventional greenhouse, this means we insulate the north wall, roof, and (to some extent) the sides which are not a source of significant solar gain. In colder climates, a reflective insulation “blanket” may be used to cover the glazing at night to further reduce the SunCatcher’s heat loss. 55 gallon barrels filled with water used as thermal mass. The SunCatcher is a highly insulated structure that captures sunlight and converts most of that light to heat. The heat is stored in the SunCatcher’s thermal mass. During a sunny day, the thermal mass prevents the SunCatcher from overheating by absorbing most of the heat while venting excess heat and moisture. During the night or cloudy days, when the interior temperature drops, the thermal mass radiates this heat and helps maintain a suitable plant environment inside the SunCatcher. This thermal mass reduces temperature fluctuations inside the SunCatcher and maintains it above the outside temperature, greatly reducing the need for daytime venting and nighttime heating. In larger models we use water-filled metal containers or phase change materials (PCM) as highly efficient thermal mass. In the evening when the SunCatcher cools down the PCM provides heat, much like an extra heater coming on when it is needed most. Integrating more thermal mass in your SunCatcher will reduce the temperature swings and increase stored heat for night and cloudy days. We encourage you to fill your smaller model with soil, plants and other mass that will help absorb and hold heat. If you have extra space, you may be surprised at the powerful effect of a simple container full of water to help regulate the temperature. Ventilation allows temperature control while bringing in fresh air with renewed CO2 levels for the plants. The lower air intake vents are opened in conjunction with the upper exhaust vents to create a natural convective air flow. This releases excess heat and humidity out of the upper exhaust vents while drawing in fresh drier, CO2 rich air through the lower vents when needed during active photosynthetic periods. The rate of air exchanges is controlled with temperature sensitive vents. During the warmer summer months, you may want to leave your vents/sides open full time or even take off the sides of your smaller model to prevent overheating. 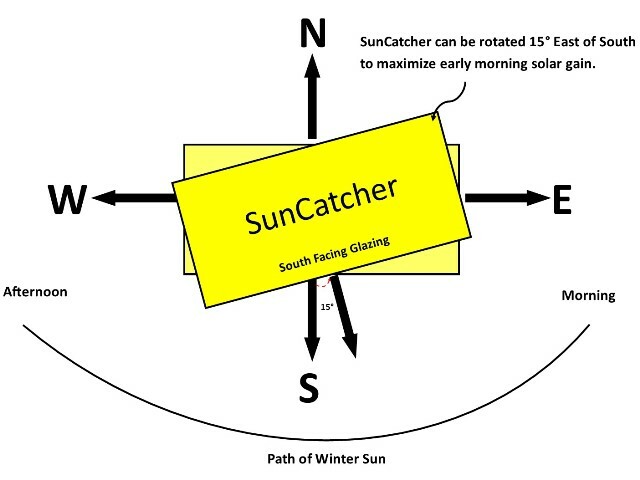 A SunCatcher is designed to capture and store solar heat so that conventional heating equipment is not needed and has been proven at zone 6B of the USDA’s Plant Hardiness Zone Map. The temperatures maintained in a SunCatcher are determined by the amount of south-facing glazing (which provides energy into the structure) and how well insulated the structure is (which reduces heat loss). Colder locations (zones 6A to 4A) will want to consider the nighttime shade to prevent heat loss through the glazing during the night. Extremely cold climates (zone 3B and colder) will require some supplemental heat. The amount of sunlight during the winter also plays a critical factor in determining your location’s needs. 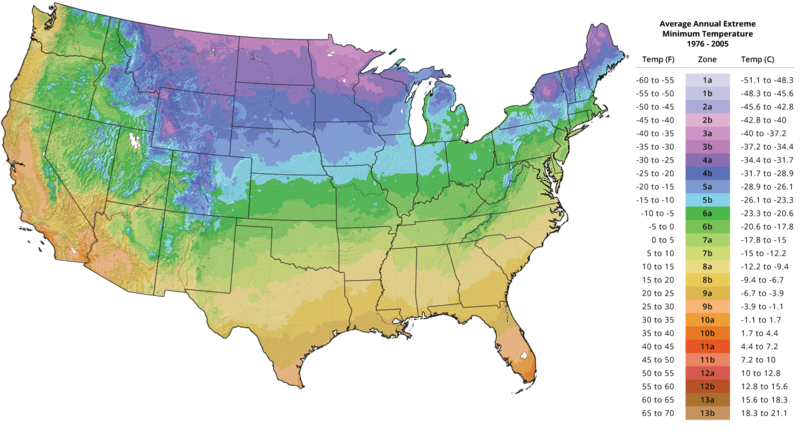 You can refer to the National Renewable Energy Lab’s PV Solar Radiation Static Maps to see your location’s solar availability each month and click on the map here to find your location’s hardiness zone. These can help determine heating and lighting needs for the winter. We love having our SunCatcher on our deck. It is inspiring to look out and see green growing plants in the middle of winter. The warmth of this small passive solar greenhouse inspires our hopes for spring and motivates our desire to plant in our garden. I really enjoy being able to harvest and enjoy fresh lettuce, kale, carrots, broccoli and more from my SunCatcher during the winter months. We are here to answer any questions you may have about the SunCatcher passive solar greenhouse. Let us know what's on your mind.